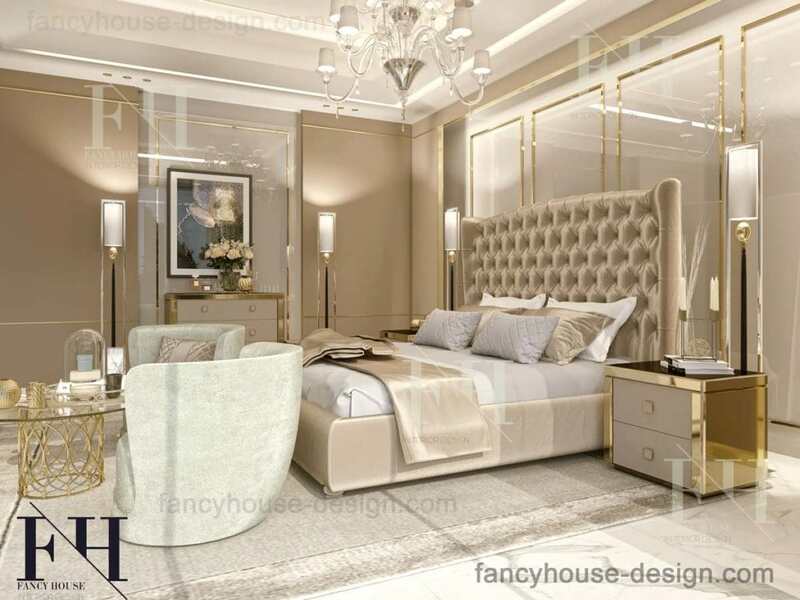 Beautiful bedroom interior design in Dubai UAE designed by interior designers of Fancy house studio in 2019 year. Last decorating ideas for master rooms in luxury contemporary styles. We develop beautiful decorative and layout solutions for master suites. 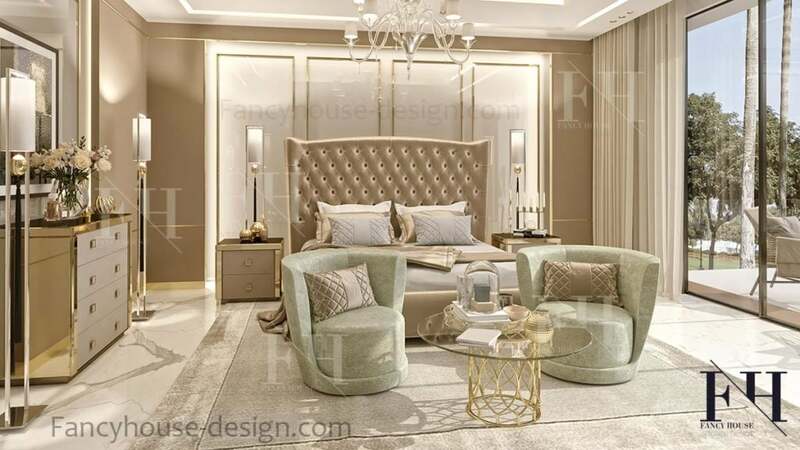 Whatever it is a house or an apartment your amazing bed should be perfectly made especially for your lifestyle and preferences of decor, finishing, furniture. We work in contemporary luxury, modern, Moroccan & Arabic styles. 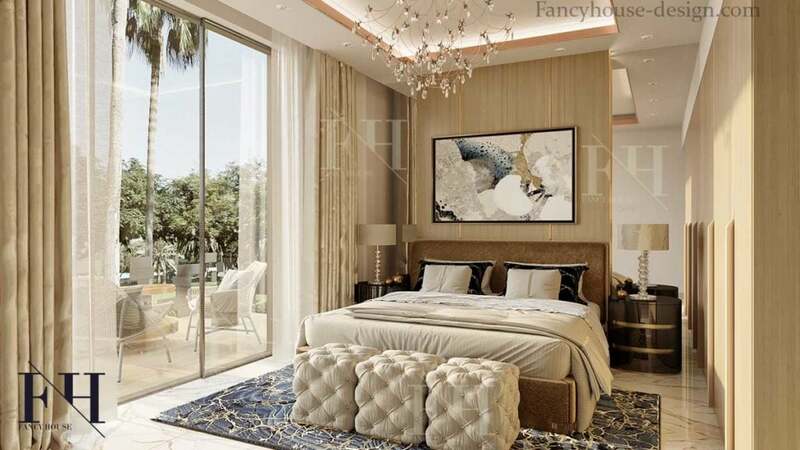 Presented beautiful modern master bedroom interior decorations are created by Fancy house designers in Dubai. Prefesional planing solutions & luxury modern finish materials make an amazing look of a bed and the entire room. 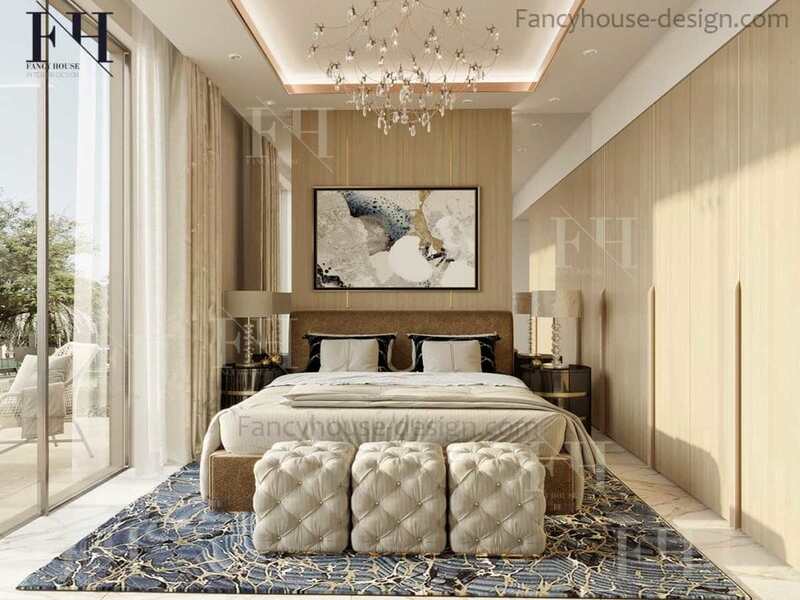 The room is decorated in a luxurious calm style with using gold stripes, glossy and wooden panels. Large bed for a couple and a beautiful view trough a full height window. You can always automatically close the curtains to get more privacy inside. The room should be properly zoned. It is advisable to create not only a sleep area, but also a rest area, which can be divided into male and female parts. Our designers correctly distribute furniture in the space to satisfy all your wishes. Color scheme is selected based on your wishes and the chosen style. It can be both traditional pastel colors inherent in the classical style, and more vivid and modern solutions. We take into account the room location relative to the sunrise, since, for example, from the sunny side it is recommended to use cold tones, namely violet or light blue. For the north side it is the best compromise to use warm colors, as well as their possible shades, then your master suite will be bright enough. All furniture, decoration, finish materials match to each other. The main role is played by the bed, but wardrobe, armchairs, bedside tables are also very important. Interested to know cost to decorate a bedroom? Find out prices here. 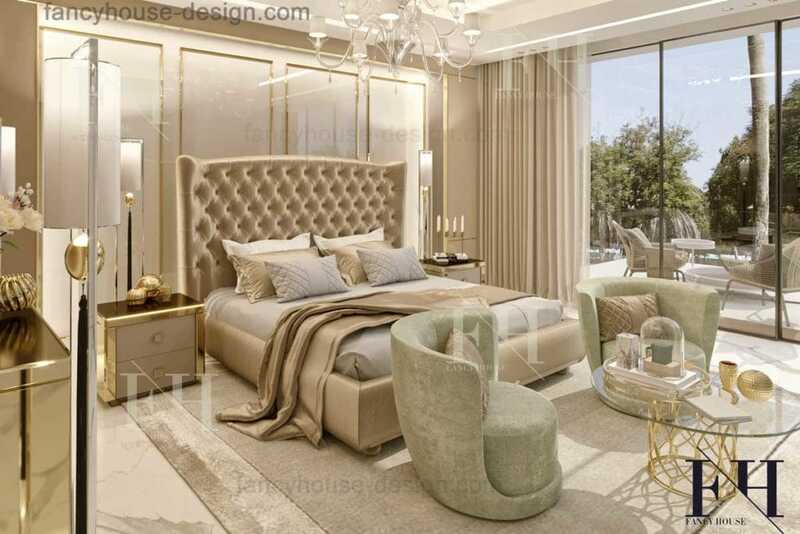 Fancy house designers do mix of latest trends & ides to develop a real brilliant master suite. A dream house is being created by professional designers & decorators. Let our team make an excellent project for you. Our price list is posted here for your conveniently. The fees shown here include the creation of an interior design project. We will create a new stylistic concept, 3D visualizations, drawings and we select a list of materials & furniture. Fit out works and purchasing are not included in the price. The fees includes a complete design package with 3D visualizations, drawings, selections. AED 130 per sq.m. for 700-1000 sq. meters homes. Above 1000 sq.meters – AED 110 per sq. m.
Would you like to get a rough cost estimatation? It is easy, just fill out the form & send it to us. If you will leave a short description in the comment field, it will help us to give you a more proper quote. Do you have a question or would like to talk about your project? Send to us an email via the form right here.